Tomorrow marks the start of the Kickstarter campaign for my eBook editing app, but today I'm excited to post a review by a new Guest Surgeon. His Majesty's Dragon is the first installment in the 9-book Temeraire Series. 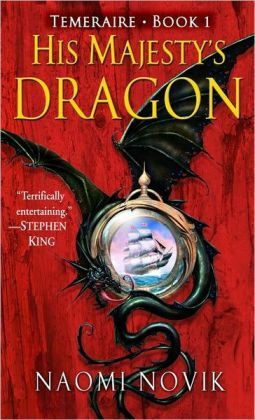 The characters were well-rounded, and there are some unique and lovable aspects of the world (specifically the relationships between the captains and their dragons). The setting was excellent, complete with historic realism in dialogue. Since it is set in the British military during the Napoleonic Wars, some sections read like a war report. Discussions on battle can get a little heavy and hard to follow. This makes the book ill-suited to younger readers. Swearing in the book is limited to antiquated British slurs, like "blast." There is no explicit sexual content, but there are adult themes like illegitimacy, as well as some innuendo that leads to a relationship of "sleepovers." The author tastefully skips over any nighttime scenes. His Majesty's Dragon gets a (PG) rating for content. Special Thanks to Dr. Burdsal for her review. You can follow her on Twitter or Goodreads. Thanks Heather! That looks like a book I need to read.